An SEO manager or consultant will factor in Google’s algorithms to gain the maximum benefits for their employers or clients. It’s also something that you can try yourself. First, let's ensure we fully understand what RankBrain is. You may have heard of PageRank. Like PageRank, RankBrain is understood to be a part of Google’s Hummingbird search algorithm. RankBrain is considered to be the third most important part of the algorithm (source). Whereas other search engines, like Bing, use teams of humans to manually to check the accuracy of results, Google believes that machine learning is a superior method because it removes human error, subjectivity, and unconscious bias. Google is secretive about the nuts and bolts of how its algorithms work. It does not want to give away its IP to competitors. Nor does it want 'black hat SEO operators' to reverse-engineer its algorithms to artificially inflate their web pages. RankBrain came into effect in 2015. In that year, it was used in around 15% of queries. Its purpose is to focus on user intent when a word or phrase is otherwise unrecognizable to Google's search-ranking algorithms. Relevant search results are what make Google (which retains over 77% of the search engine market) so satisfying, and how Google has retained its status as leader of the search engine market. What are the RankBrain Signals? Google's search algorithms rank web pages in descending order from most to least relevant across millions of web pages. And they do so in milliseconds. Particularly impressive when you consider that the user has often typed in a keyword that Google does immediately recognize. RankBrain uses human-like deduction to provide answers to search queries. Given what we now know about RankBrain, how can we leverage this knowledge to create better-ranking content? Below is a checklist that you can use - not only for formulating a content strategy for RankBrain - but for ranking highly in Google in general. Check it out, because it’s a bit different to the usual way of creating content. To come up with your own topic, check out this post on the subject; it will help you hone in on the best keywords, content types, and titles to maximize the impact (short-term and long-term) of your article. 2. Review the top 10 SERPs for that topic. Instead of throwing yourself into your subject matter, this step encourages you to get some context. It will help you avoid creating content that already exists or doing so in a way that has already been done. It will provide you with insights that could improve your content dramatically. Does the existing content answer the searcher's intent? What's good about the content? What's bad about the content? How could the content be better? What unique things could you add to the topic? 3. Keep a list of themes and keywords. Try copying and pasting the content from each page into a keyword density or keyword cloud tool for more information on the most used keywords. 4. Curate what you think are the most valuable parts of each SERP. Distill the points that seem to be key in having that result listed so high in the rankings. If Google has done its job, this should be fairly obvious. Sometimes it may be tricky; if so, don’t feel bad. Remember that there are 200+ parameters that go into determining a site's rank and you’re not expected to be able to spot them all. If in doubt, remember that Google wants to satisfy the end user by showing them a page that will cause them to stop searching. When you look at any high-ranking result, consider what about it makes it a page that could potentially end a user’s search on that topic. One way that Google creates satisfying results for its users is by showing the biggest (in terms of indexable content pages), most well-known, or most linked to site for that topic. 5. Find gaps that you can fill. Now that you have ruminated on what content is already out there, why it is working, and how it could be better, you are in a much better situation to create your own content. By aligning your content with the top performers, but also providing readers with something unique, you stand a better chance of getting into the top 10 SERPs. Find as many of these gaps as you can. This is where the magic will happen. By making your content relevant, hitting the essential points, and yet being unique, a small site with fewer indexed pages and lower domain authority than the leading sites can compete. 6. Create an outline of your article using the information you just compiled. Don’t allow your research go to waste by going off on a tangent as you write the article. Make sure that you include all the key things that made the top 10 SERPs the top 10, as well as all the things that will make your article even better than what exists on the web. a. Create sub-headers for the main themes, as well as unique additions. Don’t just throw in your article’s differences like seasoning. Be bold. Ensure that Google and your visitors notice what makes your article different from the rest, by giving your unique points weight with subheadings. b. Think about where you can include the recurring keywords within the content. Yes, plan where to put your keywords strategically too. Think about where keywords get the most traction with Google and try to get them in the best locations. Planning your keywords like this will also ensure that you don’t miss anything out. It can also prevent you being tagged as a keyword stuffer. Be fully aware of your keywords. Use them like a pro. 7. Write and optimize your content. Now that you have a roadmap and your blogging vehicle is prepped, you can put your foot down. Hit all the relevant checkpoints on the way and you will be on your way to blogging success. As we have established before, if Google likes your content, then you will attract more readers. If you follow your plan, you will be writing for RankBrain; this will make it more likely that Google will boost your content and allow you to get in front of more customers or clients. You’re still writing for your people. Consider that Google has based its entire business on serving people better; if you can optimize your content for RankBrain, you will be pleasing people and reaching more of them too. a. Free blog post checklist – we want your blogging life to be as rich as possible, without the stress. This checklist will make it easy to hit the target with every post. b. 5 content analysis tools – Check out these content analysis tools to write more effective headlines, make your content more relevant, improve your professionalism, improve your writing, and reach the audience you desire. Strategic SEO will pay dividends long after your AdWords campaigns run out of steam. You may feel like research is like spinning your wheels, because it doesn’t increase your word count, but researching allows you to refine your goal and your marketing strategy. When it comes to content creation, knowledge is power. 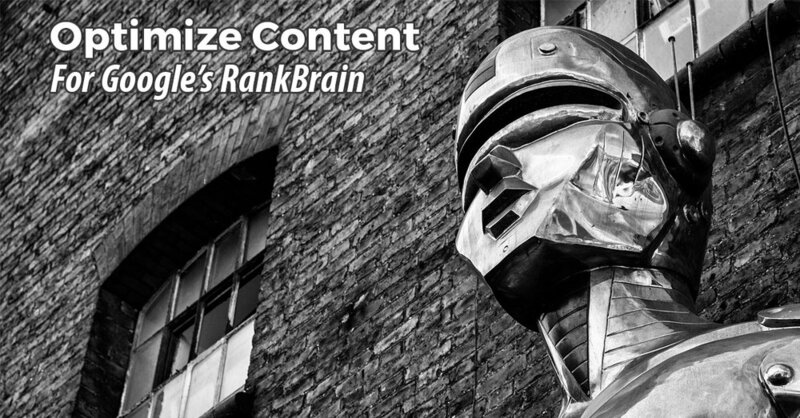 Consider RankBrain at every stage of your content creation and you can rank higher and provide more valuable, more effective content for your visitors.